Segregation is coming and the Scooby Gang cannot stop it. Well, not yet. But they can set into motion the framework of a rebellion by placing themselves in the very places that are most vulnerable. Together, they will save the world…again. Giles, like the others, needs to be integrated into society as a normal human to ward off suspicion. 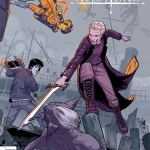 To that end, we start the issue with Willow and Buffy trying to get Giles some clothes and give him some pointers to integrate into the school system with his peers. It’s going to be a hard road, since he has no perception of how to be a regular student, much less one in the public school system. But it is vital that he pulls it off because his freedom depends on it. Buffy does manage to get him his credentials, thanks to some shady dealings, but the successful completion of that became a bit physical. When their criminal contact tries to up the price, Buffy throws her weight around and sets them right. Just because the amount of supernatural beings needing the same service has increased doesn’t mean she will allow them to be robbed. And she makes it clear that they will not go back on their deal now or in the future. Being without proper paperwork can mean loss of their way of life, as we saw. Two individuals were walking down the street at night and then the male gets attacked. Turns out he’s a satyr who did not go to the safe zone, as ordered. And even though Xander and Dawn happened upon the scene, they could not do anything to help. It’s the law. And their own freedom would be put into jeopardy if they garner too much attention anyway. It’s a no-win situation. Back at the apartment, we find out that Xander and Dawn got certified normal human as well. Willow doesn’t have that luxury. She either works for the military or has to go to the safe zone, and for her the choice is obvious. She wants to go to the safe zone so that her fellow Wiccans can be protected. And it’s likely she will not be alone, because Spike had his police credentials revoked and got an order to report to the safe zone. 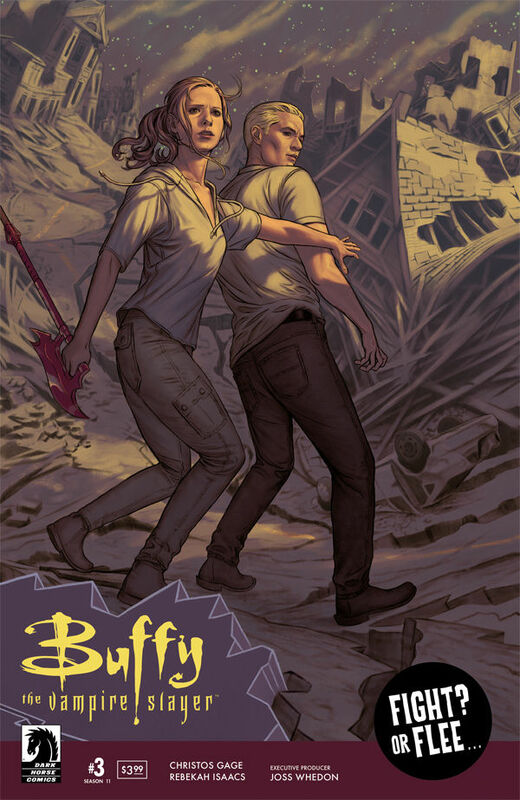 Now it’s a decision of whether Buffy will take off on the run with Spike to delay the inevitable or face the danger head-on. The decision is taken out of their hands, though. The Federal agent who took down the satyr comes knocking on their door to take Willow and Spike. 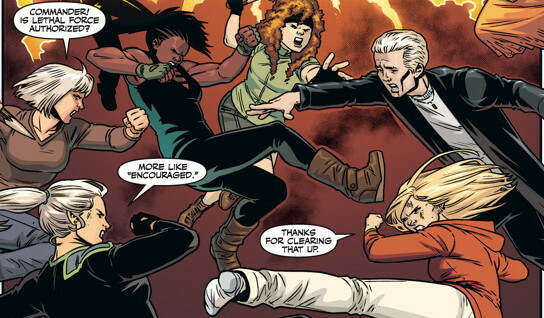 Buffy tries to fight her way out of it, and when the battle escalates it becomes clear to Spike that he needs to stop it. He surrenders so that no one else can get hurt on his behalf. No matter how much they fight, how much they try to resist, it will only cause more destruction in the end. For now, they must abide. Willow agrees to go with Spike and Buffy says she’s going, too. She has protection, as a Slayer, but she cannot let her friend and boyfriend go in there alone. They make their goodbyes and take the bus out to the safe zone. What will greet them is unknown, but hopefully they will be able to break free soon. It’s scary when comic storylines feel like they’re reflecting reality a little too closely. That’s becoming an issue now, but perhaps triumphs in fantasy can translate to real life one day. 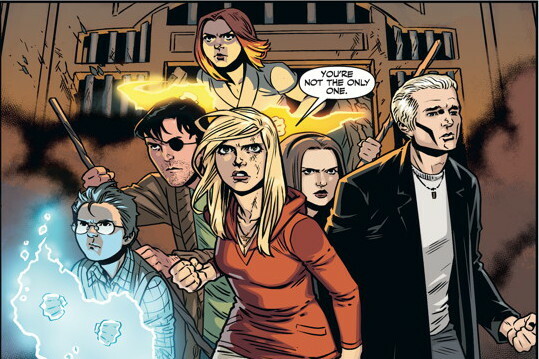 For now, we will hope that Buffy and the gang can show us the way.